The Pyramid Pandas is an age specific martial art program that focuses on improving children's basic motor and listening skills. These skills will help them enter society with a more confident and enthusiastic outlook. They will become better students at school, better listeners at home and are more ambitious towards the future. We believe the time between the ages of 3 and 7 are the most important years of a child's development. We have a different approach to our younger pandas as research has shown that putting too much pressure on younger children can hinder their development, so to avoid this we don’t have belts for our younger pandas. Instead we have a sticker system, so whenever a child has shown that they have understood a skill set they will receive a sticker and we keep the lessons with a lot of interaction with the parents, so parents can come in a watch during lessons and get involved in some of the games that the little pandas will be doing. We want our little pandas to enjoy and develop coming to lessons and we have found that they pick up new skills a lot quicker when they are having fun. For pandas aged between 5 and 7 at the end of each class, your child will be rewarded with a skill stripe for developing that skill. Each skill stripe is a different colour and your child must earn all eight coloured stripes in order to qualify to advance to the next level. Each Panda with all eight skill stripes will perform at the Pyramid Pandas belt promotion to be held every eight weeks. The Pyramid Pandas belt promotion gives your child the opportunity to show the instructors and parents how developed each skill has become. After the performance, the Pandas will be rewarded with their new belt, with which offer your child new challenges for each skill. Your child again begins to collect the coloured skill stripes as they set their goal for the next belt performance. 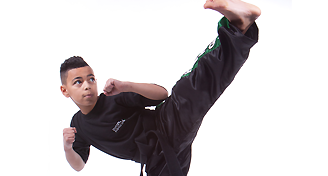 This keeps the program exciting and challenging, giving your child set goals to achieve by accomplishing their new belts. Our program will enhance positive development in a fun and motivating way and expose your child to positive social interaction. They will learn how to work with others and follow directions from their instructors. 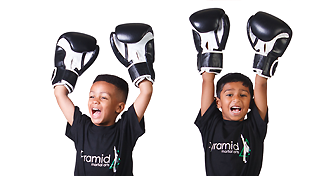 Our Pyramid Panda Instructors are specifically trained to work with children and are enthusiastic about helping children reach their goals and setting a positive example to the children they train.